Four (4) suspected cattle rustlers on Thursday dawn abandoned eight cattle they were transporting on a Kia truck with registration number AS 1786-11 from Waribogu, a farming community in the Tolon district to unknown location in Tamale. Youth of Nyohini, a suburb of Tamale metropolis who suspected the transported animals were stolen, tried trailing the suspects but they noticed they were being followed and abandoned the vehicle with the animals in it. The occupants including the driver upon realizing danger stopped abruptly on the road around the Tamale sports stadium forest and took to their heels when one of the youth beckon on them to stop . 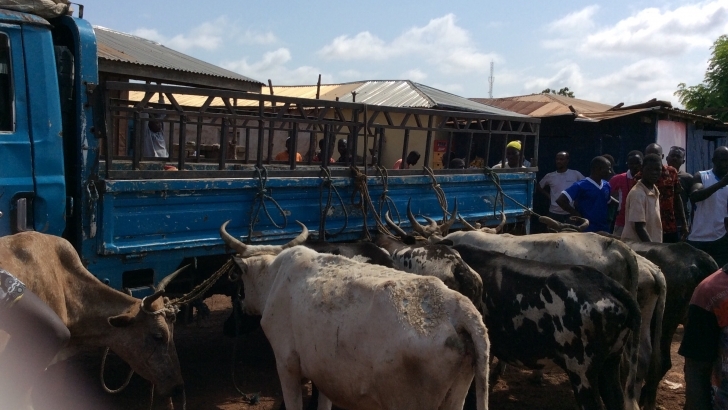 It was gathered that the suspected cattle thieves took the animals from two different cattle ranches from Waribogu and were being transported to Tamale to sell to unsuspecting butchers in view of the Islamic festivities. The matter has been reported to the Tamale Police who have since commenced investigations into the matter and making efforts to trace the owners of the stolen animals. Stealing of cattle and other ruminants is common in the region especially; during festivities is one of the major challenges facing livestock farmers in the region.